New Zealand is a popular stopover on most cruiser's trips across the Pacific - we liked it so much we stayed and became citizens. 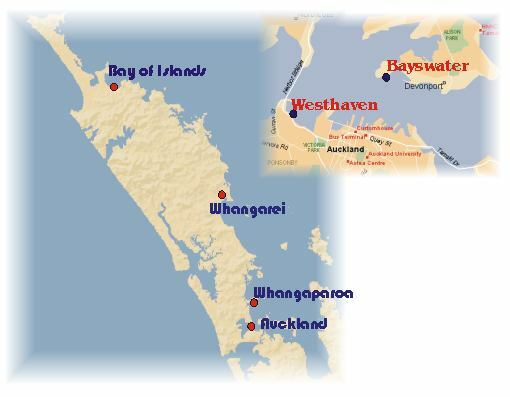 Bay of Islands - easy entry, lots of anchorages, near small towns but no big cities. There is now a marina in Opua. Whangarei - a 14 mile jaunt up a shallow river - must do on rising tide, isolated anchorages on river and sheltered marina in the heart of downtown. Whangaparaoa - at the north end of the America's Cup course, site of Gulf Harbour Marina and access to small towns but a little isolated. Auckland - the big smoke; a city of 1,000,000 with all the conveniences and several marinas in town and on the North Shore. ...take a look at the map and start exploring! Check-In Procedures - The following procedures applied when we checked into Opua, Bay of Islands. Once close to the harbor, call again. They will direct you to the Customs dock You MUST stay on board. The immigration, Customs and Agriculture Quarantine officials will visit your boat, usually in this order. Until complete, no person should leave the boat. The Agriculture official, although very nice, will probably confiscate all your fresh fruits, vegetables, meats and some canned and dairy goods. He will also remove your trash. Once this is complete, you are free to move the yacht into a slip, if you have one reserved or if one is available; otherwise you can then move to another location in the area. Temporary Import Form - All foreign yachts entering New Zealand fill in a temporary import form. The duty for the yacht is assessed and the amount declared on the form. This form can be used to have the payment of GST on marine-related purchases exempted. You must leave New Zealand within 12 months for this exemption to apply and to avoid paying duty on the yacht. If you have purchased GST-exempt marine items, the customs officer may ask to see these items installed on the yacht before allowing you to leave the country. In order to expedite your departure, visit or notify Customs 24 hours prior to your leaving New Zealand in order to schedule your checkout time and to obtain a certificate for duty-free fuel. On the day of departure, immigration and customs will visit the boat and stamp passports and issue your departure papers. If you have any duty-free items to be delivered, they must be delivered or be on board the boat for the customs officer to see. In some cases GST paid on items bought in NZ or imported into NZ will be refunded by Customs when you leave the country. Pursue this with Customs (some officials said it couldn't be done) until you determine the exact process. We obtained refunds for GST paid on $US4000 of equipment ordered from the US by persevering.